This modification is more than just beautiful. It can protect your crown from damage and any time you machine a precision barrel crown, your accuracy will most likely improve. We prefer to machine a 30 degree crown. We feel it looks the best and have had great results with it. We will also do an 11 and 45 degree crown. The 4 corners of the frame are precision micro welded on 2 bearing surfaces using small filler material and unparalleled heat control and are machined to meet the slide's dimensions. Micro welding with small filler and more centralized heat helps eliminate the chances of warping the frame when compared to conventional TIG welding. 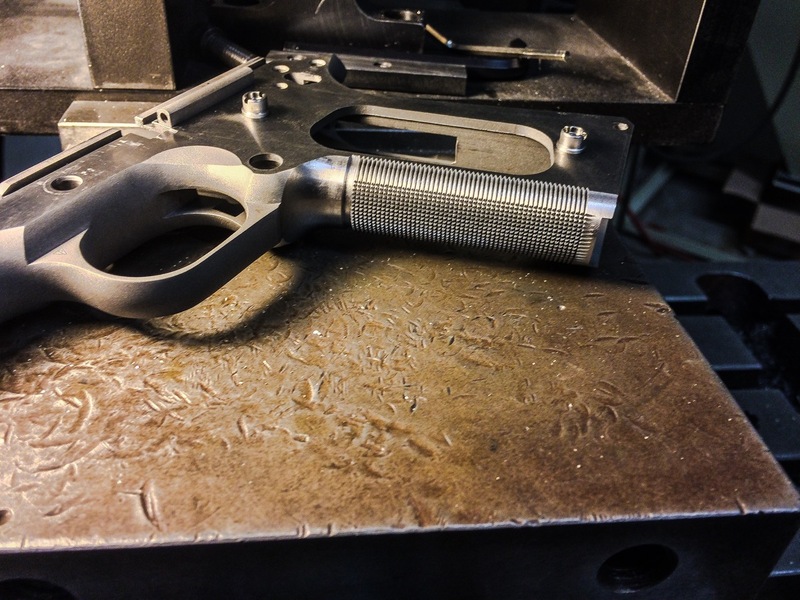 Our carry bevel is a mix of machine and hand work on key external surfaces of the firearm. 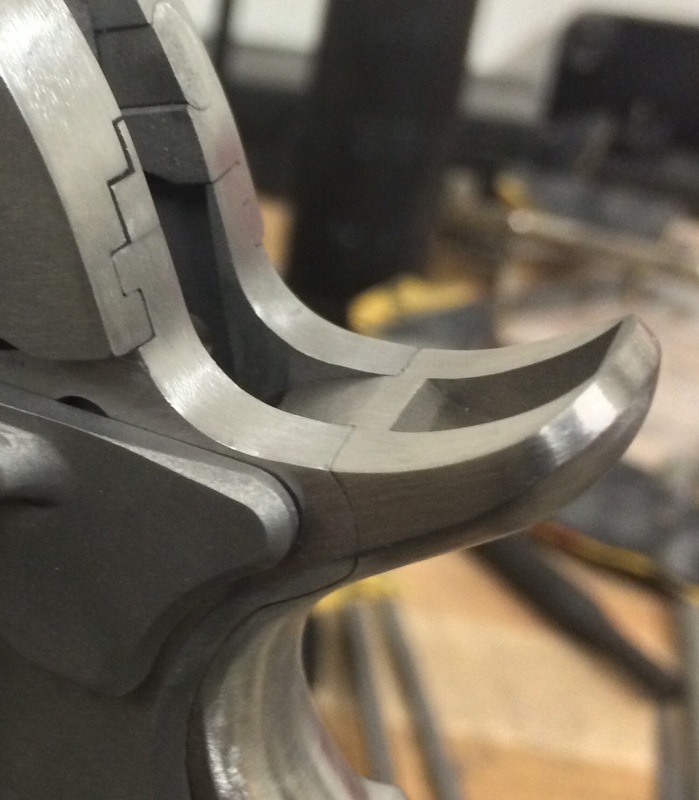 We rework the contours of the frame and slide to eliminate all sharp corners to ensure a snag free draw. 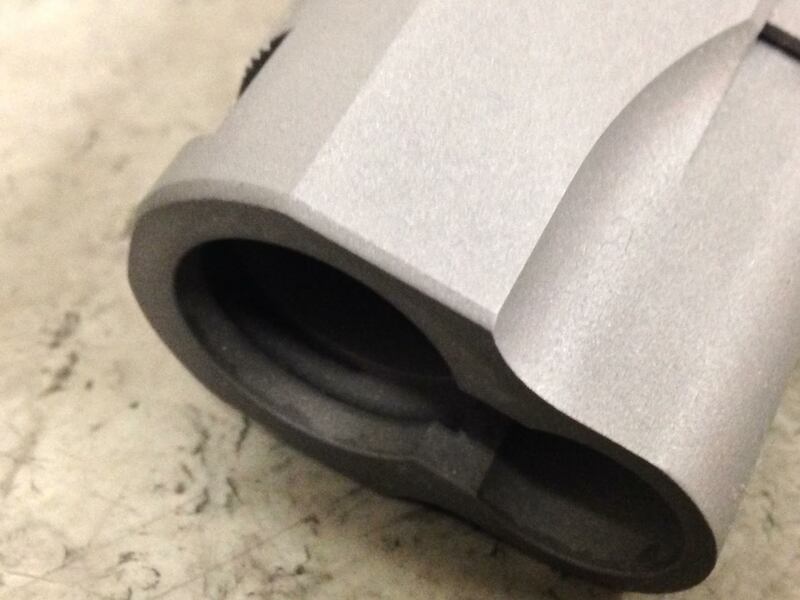 Our large machined mag well bevel opens up the standard mag well greatly ensuring quick magazine changes. Precision machined in the Novak style with our custom ground undersized dovetail cutters to ensure the dovetail is not machined oversized. The dovetail is machined to the individual sight's dimension to ensure a nice fit. 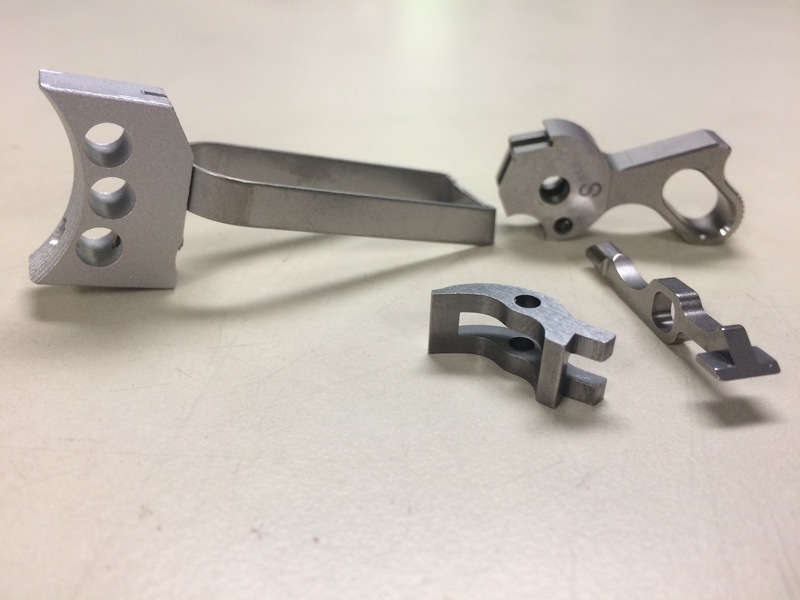 The slide and frame rounds along with the small parts are aluminum oxide blasted. The frame and slide flats are hand sanded to a beautiful brush polished look. We offer a couple levels of bluing. Please call or email to get an accurate price. 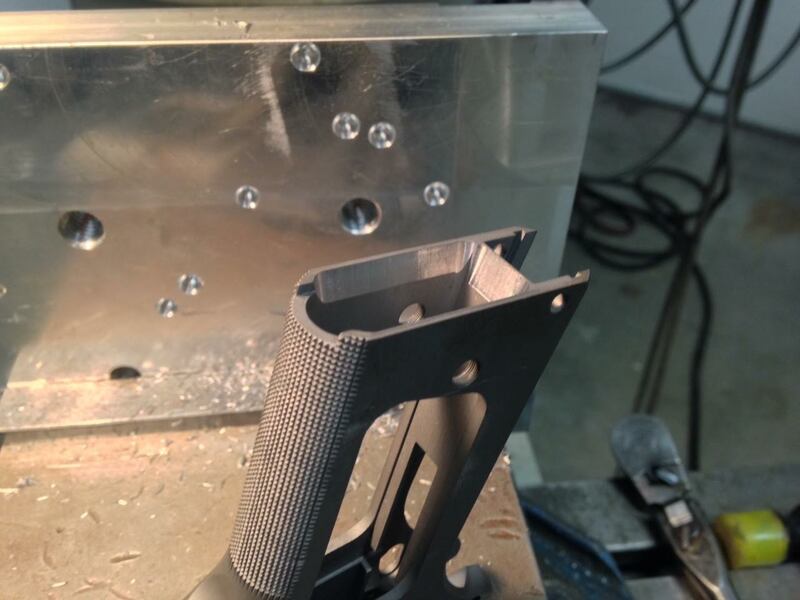 Precision machined on the mill, the ejection port is lowered to .475 from the slide bottom and a live round relief cut is machined in the front of the port. The slide is then tilted 30 degrees and the port flair is precision machined with a large ball end mill for the perfect flair. 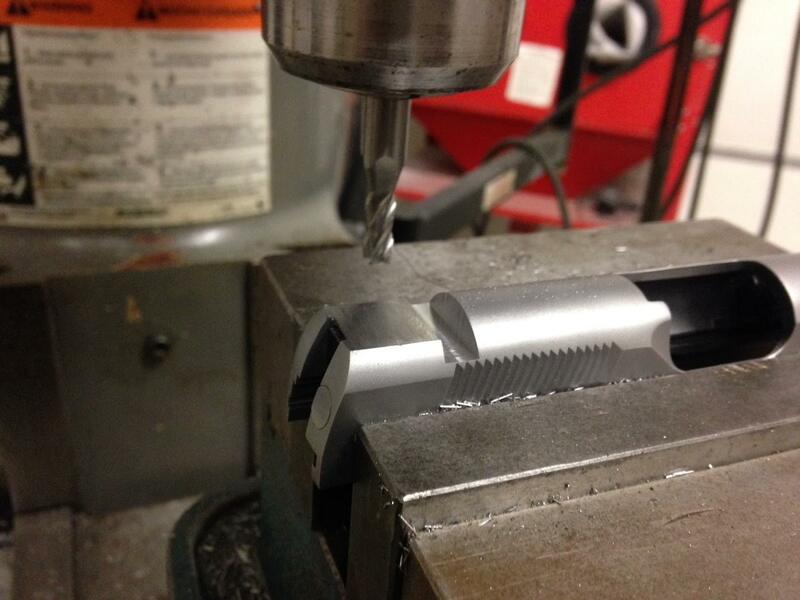 The bottom of the ejection port is then beveled. 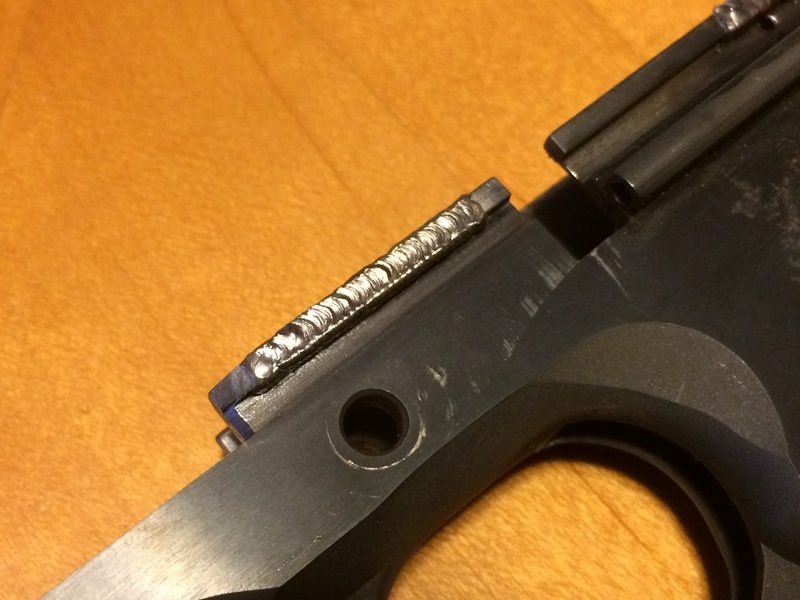 The Stan Chen Generation II magwell is truly a game changer. It allows for a huge magwell opening without adding any additional grip length and there is no welding necessary as this is a one piece design. It is available in stainless or carbon steel and in your choice of blank, 30, 25 or 20LPI. This magwell is becoming a fast favorite at the shop. Another great innovation marketed by Stan Chen, who was gracious enough to allow us to be an authorized installer of this truly innovative product. This simple embellishment can really add some character to the slide and give it a finished look. Available in a 60 degree V groove or a ball cut. These elegant hand filed serrations add a custom touch to the gun by continuing the rear sight serrations to the slide and also help reduce glare. 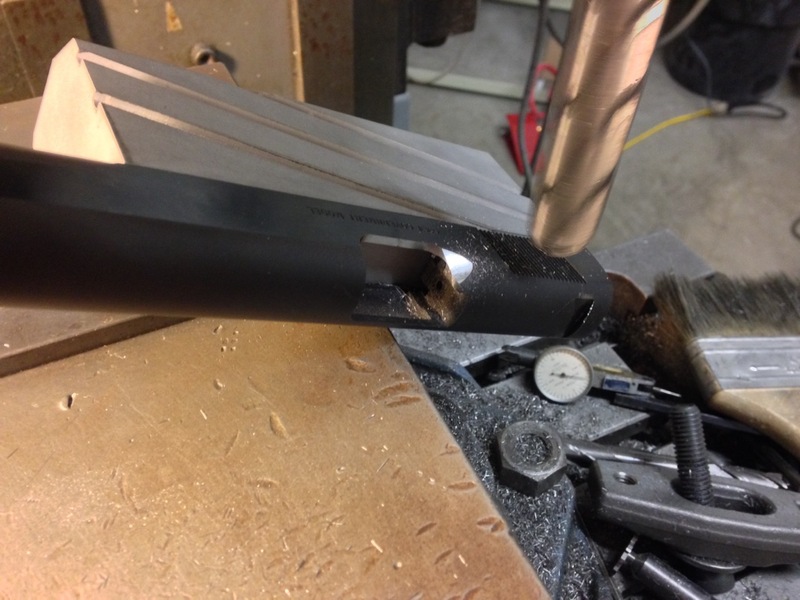 A match grade barrel is the best way to ring out your accuracy potential. We prefer Kart gunsmith fit national match barrels here at Evolution Armory but will install any top quality barrel of your choice. 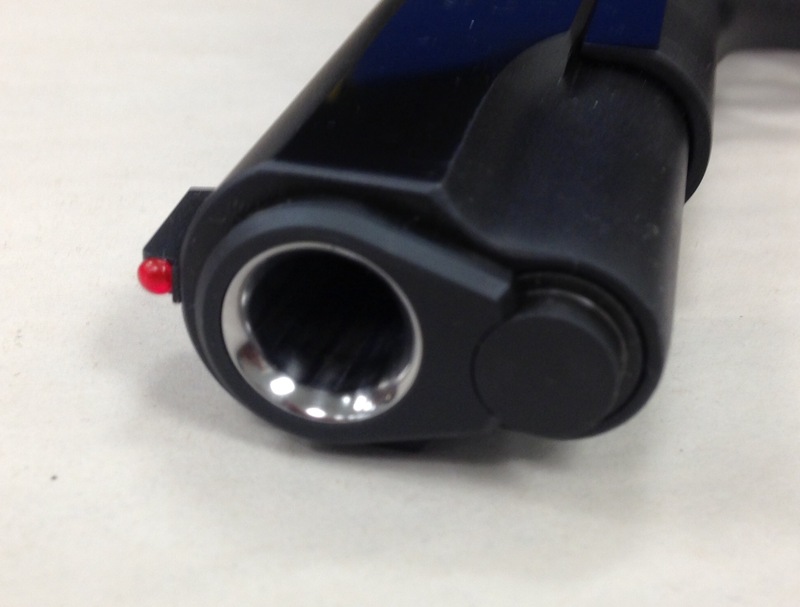 Install includes the barrel, an EGW bushing, link and link pin sized right for your pistol. Prices start at $450 for a Kart standard profile barrel. Ramped barrel machining is an additional 80 dollars and refinishing costs for a ramped barrel install will apply. An additional fee may be charged for non Kart barrels, depending on the cost of the barrel. 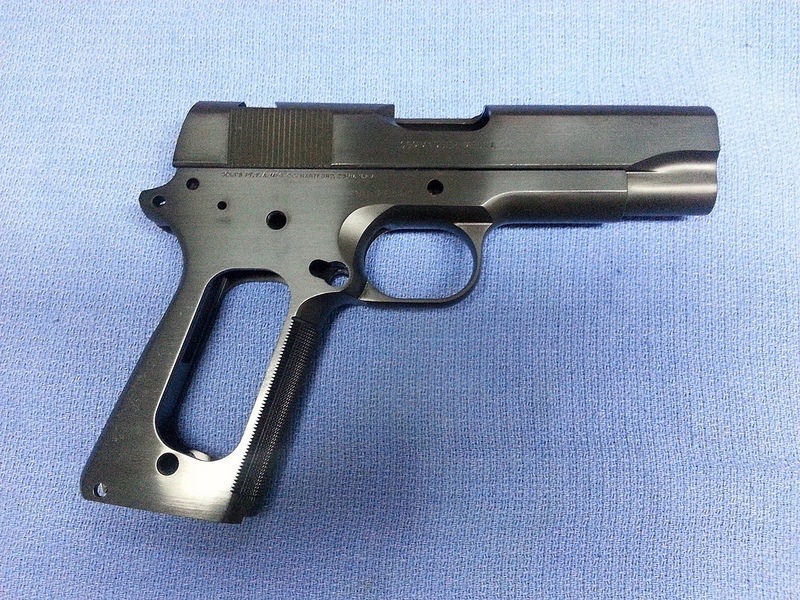 This modification gives the slide a look like a Browning Hi Power and provides some grip to perform press checks without having to machine cocking serrations on the front of the slide. Minimum slide thickness between the outer wall of the slide and the lowest part of the barrel bushing slot must be met or the modification can not be performed. Not all slides will be able to have this modification, especially if front cocking serrations are already present. Refinishing is required and separate. 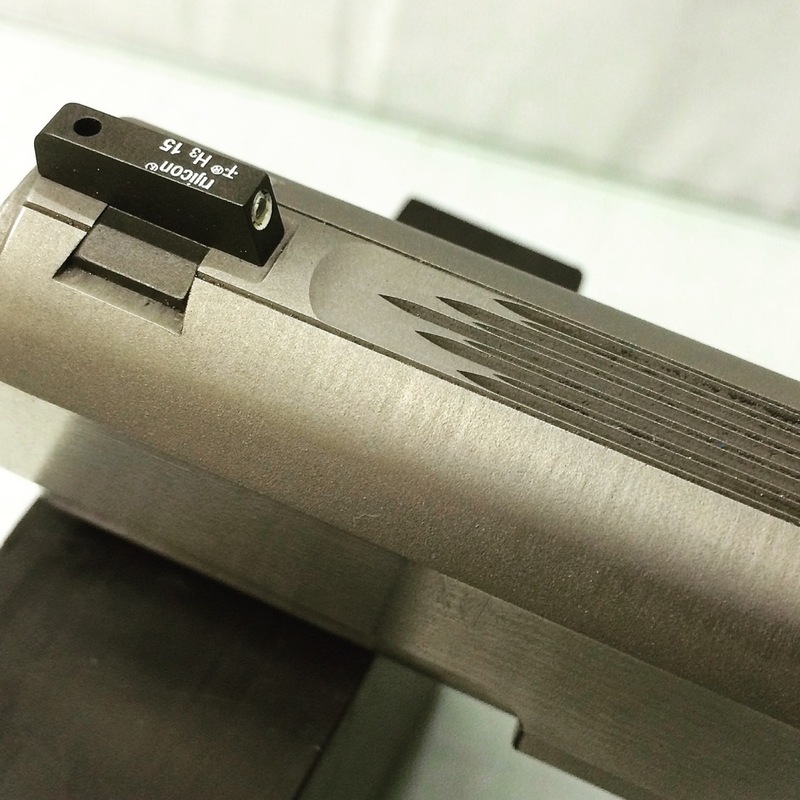 This good looking machine cut replaces the standard 1911 slide flair with a clean looking ball end cut that lines up better with the dust cover. Refinishing is required.